Jerusalem is the place where G-d chose to put His Name. The Temple Mount is the place in Jerusalem where G-d chose His Divine Presence to rest. Tradition says that it was in this place that G-d gathered the dust used to create the first man, Adam. On the mount, Avraham bound Isaac and the substitute lamb was provided. The first and second Temples were built here. A future third Temple will be built here. From this location, the Word of the L-rd is to come out to all the nations. (Mich 4:2)The Temple Mount is the holiest site in Judaism. It is the place to which we turn to face in prayer. It is the place of utmost significance to G-d himself ~ past, present and future. All eyes are turning and looking in the direction of the Temple Mount in wonder, awe and curiosity. 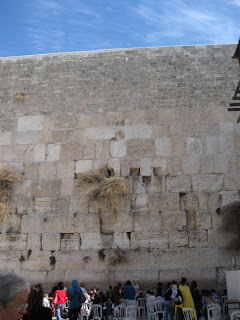 The Kotel is a small part of the surrounding wall, the last remaining vestige of the ancient Temple area. Is there any other place in the world where one can go to pray like the Kotel? To which city did G-d say, “I chose you to rest my Presence”? And to which nation did He promise this special possession, this ability to draw so near? To His People, Israel. The mystery of G-d in this place is beyond total comprehension. But for those who have been there, quieted themselves, and waited, there is a ‘knowing’ that transcends words. When one has been to the Kotel to pray, to praise, to rejoice; one goes away refreshed like never before. Interesting this little bit of history about the Kotel the same week the PA is denying that there is any link between the Wall and the Jewish people! Oy! The first time I saw the Western Wall I came out into bright sunlight from the tunnel from the souk ... it looked radiantly golden beneath a blue summer sky. The first time I stood next to the Western Wall and placed my hand upon it I cried buckets and buckets of tears. The presence of the Lord was all over the place.